SpiroZone is a patented distribution manifold that collects water from one or more sources and distributes it to one or more zones. Pumps are used to circulate the water, each heat source and heat zone operate independently of each other. When the pump in a particular zone or boiler circuit is inactive, no water moves in that circuit. Precisely controllable flows in multiple zones are maintained, with no crosstalk. System design and implementation is greatly simplified. Each zone or boiler circuit can be planned as an individual module without the need to consider its effect on the rest of the system thus minimizing pumping power consumption. Internal pressure activated valves maximise thermal separation of hot supply and cooler return flows, minimising internal leakage of heat. 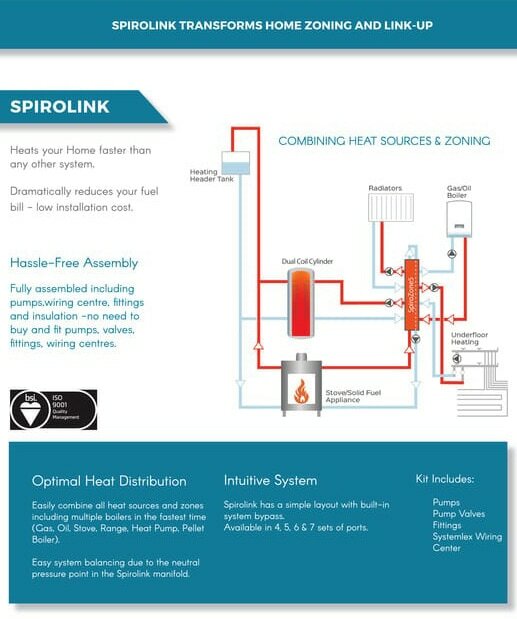 SpiroZone is an inexpensive and simple alternative to valve controlled zoning methods. Manifold is fully insulated to limit any unwanted heat loss. The unit is compact and weighs only 2.4kg. It can be orientated in ANY direction for installation. Built-in controlled system by-pass: Normally a by-pass must be built into a heating system for the boiler. This is already designed into the SpiroZone. Due to the internal pressure activated valves on the by-pass circuit, Non-Return Valve’s are required for all Heat Sources and Heat Zones. 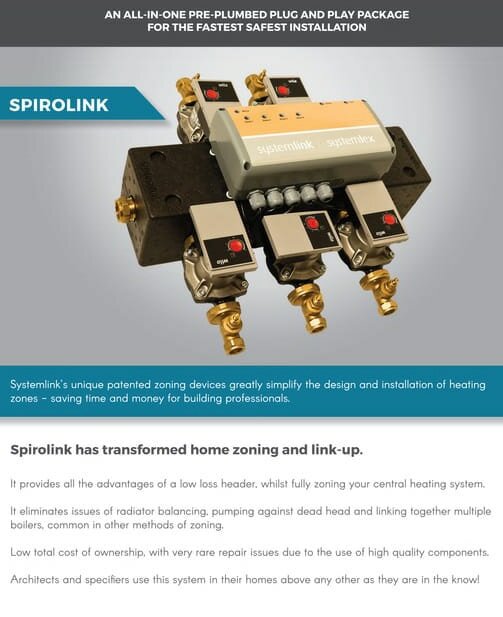 SpiroZone eliminates time consuming individual circuit balancing. SpiroZone automatically creates a neutral point within the unit. Balancing a conventional system can be difficult as pressure drop varies depending on what zones are open or closed at any particular moment. Manages heat distribution for all heat sources including oil, gas, solid fuel and geothermal.